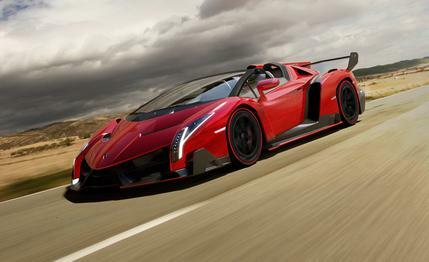 Lamborghini Veneno Roadster Photos and Info – News – Car and Driver. Of course, the roadster inherits the coupe’s brutal-yet-beautiful styling, which takes Lambo’s signature look and kicks it in the teeth with a pair of radioactive boots. The front end essentially comprises everything from the windshield header down, with the profile plunging down a nearly constant arc to the tip of the super-low, arrow-shaped prow of the hood. A carbon-fiber ground-effects package juts and angles its way around the lower fascia to the body sides, where it splits just before the rear wheel to visually separate the rear fender bulges from the main fuselage. The Countach-style canted fender openings lend the impression the car is shouldering into the force of the atmosphere it’s pushing through at hyper-legal speeds, and the adjustable rear wing can be tilted to match. If you do happen to stumble across one, perhaps at an auto show or a Pebble Beach event a few decades from now, the biggest treat will be to simply behold one of the most extreme road-going race-car analogues extant. And maybe even to hear it—after all, a big chunk of the Veneno’s power advantage over the “mainstream” 691-hp Aventador comes thanks to exhaust tweaks. The Aventador sounds nice. We imagine it sounds even nicer when it’s de-restricted and the roof’s been torn off. Now excuse us while we go figure out how to make piles upon piles of money, because as nice as the Veneno roadster is to look at, we sure as hell want to drive one.